I started reading this book years ago, but couldn’t get into it. Someone encouraged me to try again and I’m glad I did. It is slow in the beginning but my patience was rewarded with engaging comedy. The main character is Rincewind, a wizard who can’t do magic. At the start of the book, he meets Twoflower, the discworld’s first tourist, who has come to Ankh-Morpork from a far-away land known as the Counterweight Continent. Twoflower has with him a magic luggage which follows him everywhere and is filled with gold coins. They then get into one predicament after another, involving a Lovecraftian monster, dragons, trolls, and Death himself. In a 1985 lecture on fantasy in literature, Pratchett describes it as “an attempt to do for the classical fantasy universe what Blazing Saddles did for Westerns.” To me, the Discworld books are like a fantasy novel sitcom, like Red Dwarf (a sci-fi sitcom) but with swords and sorcery. This book ends on a cliff hanger, so plan on reading the second Discworld book to find out what happens to all the characters, but different settings and situations are introduced in later books, all taking place on the Discworld. There is a tv film adaption starring David Jason as Rincewind, Sean Astin as Twoflower, Tim Curry as a wizard named Trymon (who has a bigger role in the next novel), and Christopher Lee as Death. I’m looking forward to reading the rest of the Discworld series. Sir Terence David John “Terry” Pratchett, OBE (born 28 April 1948) is an English author of fantasy novels, especially comical works. He is best known for the Discworld series of about 40 volumes. 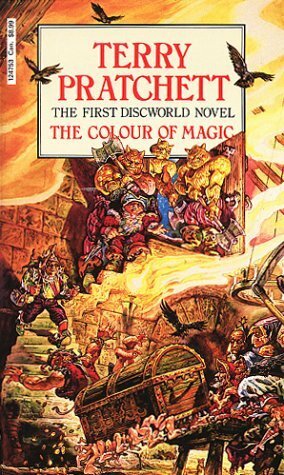 Pratchett’s first novel, The Carpet People, was published in 1971, and since his first Discworld novel (The Colour of Magic) was published in 1983, he has written two books a year on average. Pratchett was the UK’s best-selling author of the 1990s, and has sold over 85 million books worldwide in 37 languages. He is currently the second most-read writer in the UK, and seventh most-read non-US author in the US.